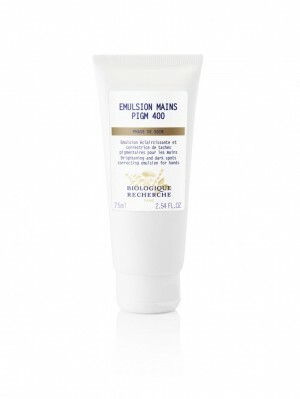 Emulsion Mains PIGM 400 is a multi-benefit treatment cream with a high concentration of active ingredients that counters the imbalances in dry, damaged and pigmented hands. The skin of the hands is naturally dry and hands are the body part most frequently exposed to UV radiation, causing age spots to gradually appear. It is therefore essential to prevent and reduce the appearance of age spots while restoring the hydrolipidic barrier of the hands in order to preserve their beauty. This rich hand cream provides proper hydration of the surface of the epidermis, which causes an immediate smoothing effect and provides protection against external aggressions, such as winter and summer dryness, that may accelerate skin ageing. Hands are thereby protected and skin is evened out, for a youthful appearance. Read our blog post for pampering your hands.